Carol Jean “Fluffy” Ringlein, 75, of Tiffin, passed away Sunday afternoon, Sept. 9, 2018, at St. Francis Home, Tiffin. She was born Nov. 14, 1942, in Norwalk, to Ambrose and Ida Jeanne (Hull) O’Brien Sr. She married Alvin F. Ringlein April 17, 1971, in Wakeman. Survivors include her husband, Alvin, of Tiffin; one brother, Ambrose (Caroline) O’Brien Jr. of Norwalk; two sisters, Pat (Earl) Harris of The Villages, Florida, and Lola (Robert) Dusza of Michigan City, Indiana; seven nephews; seven nieces; one aunt; two cousins; 16 great-nephews; and seven great-nieces. She was preceded in death by her parents and one nephew. Carol was a nurse’s aide for Heartland Hospice for more than 20 years, and a member of St. Mary Catholic Church, where she was a member of the Rosary Altar Society. She also was a member of Tiffin Eagles No. 402 and Daughters of Isabella. She enjoyed farming, helping a lot of people with a lot of projects, cross-stitching, gambling, cards, bowling and traveling, and Carol loved spending time with her family and friends. Friends may visit with the family from 10 a.m. until the time of Mass Friday, Sept. 14, 2018, at St. Mary Catholic Church, 85 S. Sandusky St., Tiffin, OH 44883. 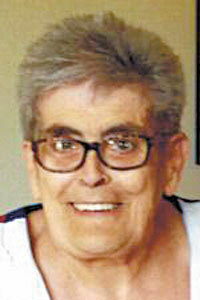 Her Mass of Christian burial will begin at 11 a.m. Friday at the church, with the Rev. Gary Walters officiating. A rosary will begin 20 minutes prior to Mass. Burial will be at 2:30 p.m. in St. Sebastian Catholic Cemetery. The family would like to thank Kiwanis Manor residents and staff, and St. Francis Home. The family also would like to thank three special people, Jim Hughes, Debra Darling and Logan Darling, for all of their love and support throughout the years.